The weather here has been unseasonably warm lately, with temperatures hitting the 90s last weekend, but fortunately, the weather has returned to more fall like weather. I love fall weather, it is the perfect time of year to sit on the porch or curled up on the sofa reading a book. Of course, yesterday, with only 100 pages to go in An Inconvenient Beauty, I found myself sitting at the table and reading while I enjoyed a nice hot cup of pumpkin spice coffee and getting up only to make another cup of coffee. I thoroughly enjoyed An Inconvenient Beauty and couldn't put it down. In fact, when I did put it down after reading all 379 pages, my daughter commented 'didn't you just start that book'...as I closed the book and exclaimed 'I can't believe that was the last one in the series, I want it to go on!' It really was a great story, that was well written and had great scene and character development. Having met Griffith and the rest of the family in an Uncommon Courtship, which was the third in the four book series, I was glad to get to know him better. His family is the type of family that anyone would be happy to be part of, a group that is there for support and guidance, a group that knows how to play and have fun together, and a family that loves to pick on one another but would not fail to support one another. Isabella and her cousin Frederica were well developed characters and both had to overcome adversity. Isabella not only had her challenges at home, problems she was hoping to solve with her time in London, but the added complexity of the role her uncle expected her to play and the threats he held over her. Freddie had only her father to deal with, but she clearly had a strong character having survived the loss of her mother and brother, but also as evidenced in the way she carried herself and the role she played in helping the right things happen. Reading a story from an era with very different societal norms and expectations is always interesting to me. Despite recognizing how different of a time it was for women, there is still something so intriguing to me. On one hand, I think it would be so fun to get dressed up and go out to events, but I think that by the end of a season I would be well beyond interested in dressing up and putting on my 'social face'. I think that the idea of having a chaperone with you at all times as you court seems a bit extreme (and how boring for the chaperone! ), but love how innocent courting was - filled with visits to see art and walks in the park. 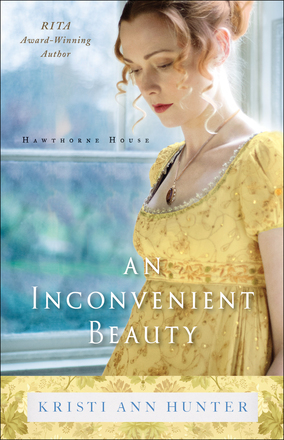 An Inconvenient Beauty is a great reminder that sometimes the best way to find love is to not look for it. In fact, even when you are avoiding it (or someone), a love that is meant to be will find a way (and likely make you appreciate it more). I have only read the last two books in the series, but I would highly recommend reading the Hawthorne House series by Kristi Ann Hunter. I intend to pick up the first two books myself, so that I can read them.